Countries, like individuals and companies, have a reputation and this is generated from the perceptions that different interest groups and the international community have about a particular country. 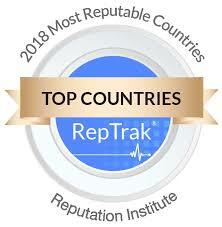 This year the Reputation Institute presented its 2018 Country RepTrak® report to assess the state of the countries’ reputation. It´s been 10 years since the first report came out and this year it brings us very interesting data. Naturally, what generates more curiosity is the ranking of countries with the best reputation. Once again, the countries that lead this table are not the traditional superpowers, but a group of medium or small sized nations admired internationally for the strength of their institutions, the social welfare enjoyed by their inhabitants and their quality of life in general. This year Sweden occupies the first position, followed by Finland, Switzerland, Norway, New Zealand, Australia, Canada, Japan, Denmark, and Holland. Of the three rational dimensions that explain the reputation index, Sweden is the best-perceived country in “institutional quality”, New Zealand in “quality of life” and Japan in “level of development”. One of the most important conclusions is that a country´s reputation has a direct impact on the support behaviors of international observers (would visit the country, would buy their products, would study or work there, etc. ), which ultimately influence the economic variables. The report notes that good reputation not only brings economic benefits, but also allows these countries to play a role in the international community far beyond what their objective size seems to grant them, both in their presence in international institutions and in the relevance of their political and social-economic positions. No country in Latin America reached the top 20 in 2018. It should be noted that the large drop in the reputation indicator of Latin American countries (on average -2.6 points Pulse) may be directly related to indicators linked to the quality of their governments and other institutions, and social welfare. The study interprets these results in due part to the political, economic and social crises of several countries, as well as the high-profile corruption cases that have affected high level officials in some governments, resulting in poor perception of these countries. By Gustavo Manrique Salas, Director of Strategic Communications & Partner at Stratego.